Here he is, at the Grove Street Path Station, looking a bit shy. 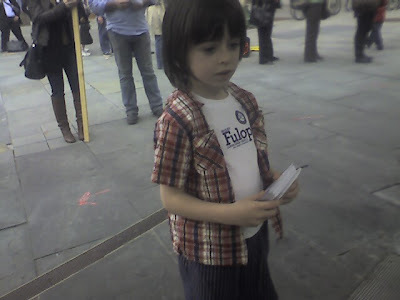 Izzy eventually got the hang of it and he helped encourage Jersey City residents to vote for Steve Fulop, running for re-election as Councilman for Ward E.
Funny to watch how commuters were far more apt to politely take a card from him than from the older volunteers. I am glad I enlisted his help and even if he doesn't quite understand what it all means, it is a good introduction to politics. Since we were volunteering at the dinner hour, there was little time to cook so we ended the day with some Chinese takeout.